Fancy buckskin gelding that was born and raised on our ranch. Ash has been ranched on the last two years and has been pasture roping and doctoring this summer. He is a smooth moving gelding that covers the country and is really quiet and easy going. His full sister is a money earner in Ranching Heritage events and is a World Versatility Ranch Horse Qualifier. 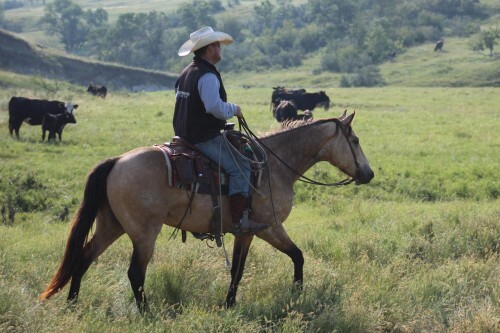 Ash is AQHA Ranching Heritage eligible. He is consigned to the NILE Gold Buckle Horse Sale on October 20, 2018 in Billings MT. For sale info go to www.Thenile.org. For more information on Ash go to www.swensonmartinhorses.com.